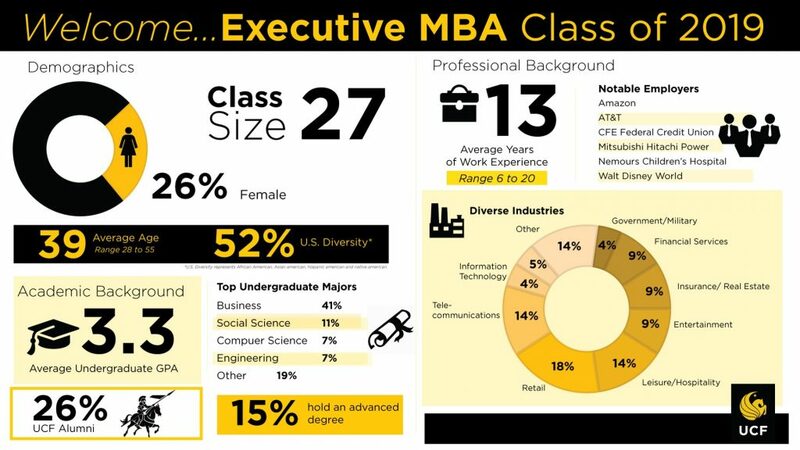 The UCF Executive MBA, accredited by the AACSB, prepares today’s experienced professionals for the challenges they will face as they work and advance in their careers, teaching students skills across all function areas of business, making them an increasingly valuable member of their organization. The UCF EMBA offers a leadership-relevant curriculum which provides students with cross-functional business knowledge and encourages application of new theories and principles in real-world situations. The UCF EMBA consists of 13 courses comprised of core analytical courses which build a solid foundation for advanced functional business topics and capstone courses focusing on “boardroom” leadership development and executive strategy. Innovative teaching methodologies such as team-based projects, interdisciplinary case studies, simulations, debate activities, and self-assessment exercises are used to enhance the EMBA learning experience. With its cohort format, incorporating the interactions and diverse backgrounds of the participants is an integral part of the UCF EMBA learning experience. The UCF EMBA includes an international residency (up to 10 days) which provides students with an enlightening global business perspective during the fourth term (fall) of the UCF EMBA program. The residency typically includes visits to two cities within a country or two countries. Previous UCF EMBA international residency locations include: Johannesburg and Cape Town, South Africa; Ho Chi Minh City, Vietnam and Hong Kong; Berlin, Germany; Barcelona, Spain and Milan, Italy; and Beijing and Shanghai, China. In-depth financial markets research and analysis is incorporated into the UCF EMBA curriculum through the use of its state-of-the-art Bloomberg Financial Markets Lab. Students access real-time financial markets data, news and analytics through the Bloomberg Professional service (Bloomberg terminals). Use of the Bloomberg Financial Markets Lab is available to the student while enrolled in the EMBA program. Students are also able to capitalize on the use of the Bloomberg Professional service by completing Bloomberg’s self-administered Bloomberg Essentials Online Training Program and earn an Acknowledgement of Completion (previously Bloomberg Certification). Included with the UCF Executive MBA program is the Executive Mentoring Program. The program was designed to facilitate the transfer of knowledge and expertise in our community through connecting our graduate business students with UCF alumni and key business influencers to assist with career development and potential realization. Students who choose to participate in the Executive Mentoring Program will be matched with a volunteer mentor for the purpose of professional growth and career guidance. The match is based on a combination of factors including job function, industry and career goals. The UCF EMBA is offered every August and meets three Saturdays and one Friday per month, 8:00 a.m. to 5:0 p.m., over a 19-month period at the UCF Executive Development Center’s state-of-the-art downtown facility. The UCF EMBA is designed for mid- to senior-level professionals with ten or more years work experience, who bring unique insight to the classroom learning environment and team experience. Requirements include: A 3.0 GPA undergraduate degree from a regionally accredited institution and a minimum of five years professional work experience. The UCF MBA offers foundation core on-line modules in accounting, economics, finance, and business statistics. These modules are offered to help students build the foundational knowledge needed to succeed in the UCF MBA. Students with a non-business undergraduate degree are required to take each of the four free ‘Initial Assessments’ in accounting, economics, finance and business statistics. See instructions below for detailed information regarding the assessments and enrolling in the on-line modules. 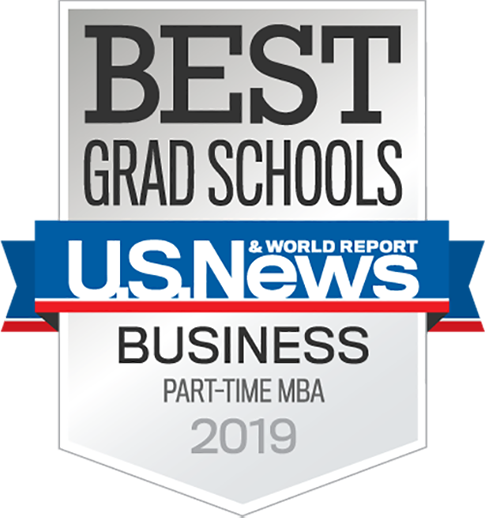 The UCF EMBA is a market-rate program with an investment of $47,000 which includes international residency, use of Bloomberg Financial Markets Lab, laptop computer, financial calculator, breakfast and snacks on class days, parking, and lifetime UCF Alumni membership.